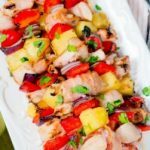 Today, I have for you the perfect summer grilling recipe – Juicy Bacon Pineapple Chicken Kebabs. Picture this – Juicy chunks of char-grilled pineapple and chicken are interwoven with smoky bacon strips grilled to perfection. Simply delicious! The bacon in itself tastes divine but woven around the other ingredients on the skewer, it infuses them during the grilling process with bacon goodness. And the chicken and veggies taste amazing if marinated for several hours in the sweet and sticky Hawaiian marinade. You’ll be licking your fingers through the whole meal and asking for seconds! For the Hawaiian marinade: Combine all ingredients in a medium saucepan and stir until the arrowroot (or cornstarch) powder is dissolved. Bring the mixture to a boil, reduce the heat to medium and simmer for 2 minutes. Place chicken in a zip lock bag and pour half of the marinade on top. Place pineapple, red bell pepper & red onion in another zip lock bag and pour the other half of the marinade. Marinate for at least 30 minutes (for best results marinade for several hours or overnight). Meanwhile, if you use wood skewers soak them in water for about 20 minutes. Thread the skewers. Weave the bacon around each piece of chicken. You’ll need two strips of bacon per skewer if using 4 pieces of chicken. Add pineapple, stick the bell pepper and onion together. I usually use 3 -4 pieces each of pineapple, bell pepper and red onion per skewer. Brush some olive oil evenly over each kebab. Preheat the grill to medium high. Grill the kebabs for 10-15, turning a couple of times, until done. 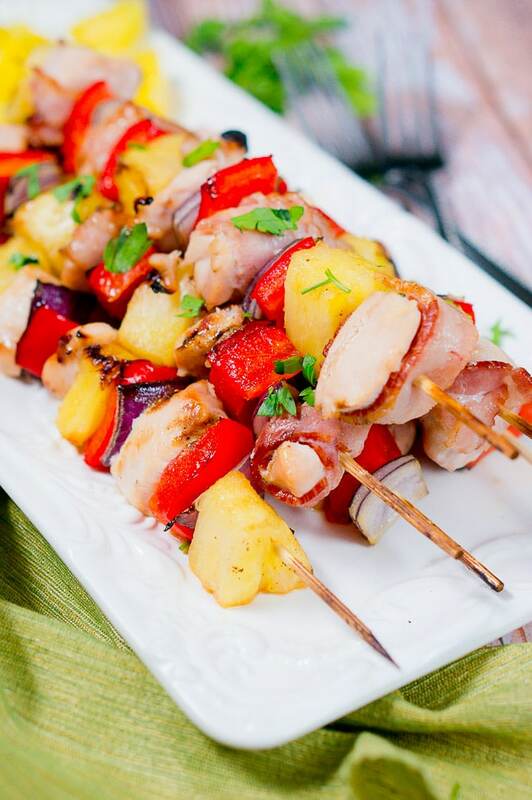 Perfect summer grilling recipe - Juicy Bacon Pineapple Chicken Kebabs. You’ll be licking your fingers and asking for seconds! Thread the skewers. Weave the bacon around each piece of chicken. You'll need two strips of bacon per skewer if using 4 pieces of chicken. Add pineapple, stick the bell pepper and onion together. I usually use 3 -4 pieces each of pineapple, bell pepper and red onion per skewer. Brush some olive oil evenly over each kebab. Prep time excludes the marinating time. The nutrition label excludes the marinade since it's discarded. 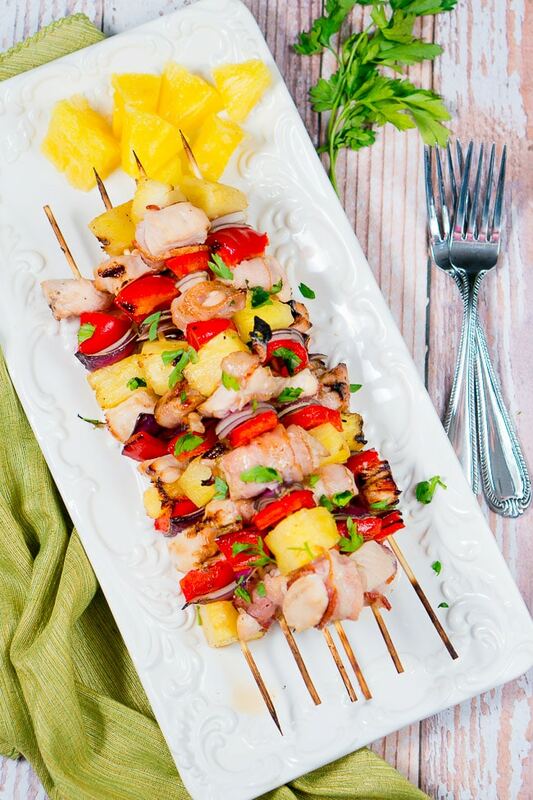 Bacon and pineapple is such a wonderful combination, these kebabs sound delicious! Thanks, Joy! 🙂 i agree it’s a great combination, and one of my favorite ways to eat kebabs! These look delicious, they would be great for our next cookout! These are beautiful! I love the addition of bacon on these. I have never tried that! Yes, I love kebabs because you do your veggies & meat at once, and they are easy to make. These are beautiful and sound so delightful!! Great for the next cookout we have! 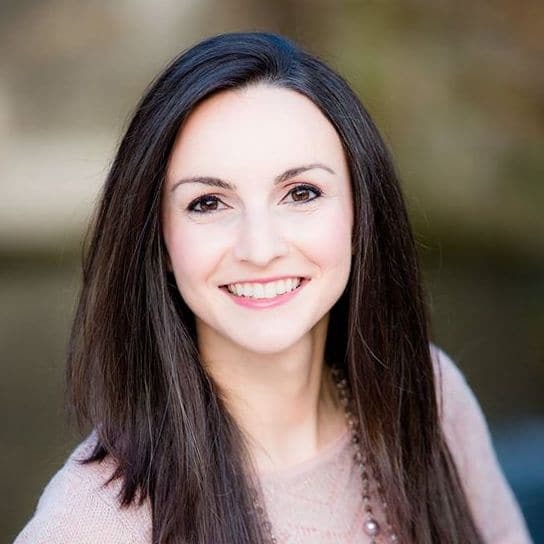 Would love if you came over and shared on Try a Bite Tuesday Link Party!! These look so delicious. Love the photos too. I am saving this for my next cookout. Thank you!! 🙂 I am sure you will love them! You sold me at bacon, but the pineapple and chicken is a bonus! These look deliciously amazing :). These are beautiful. What a great idea to wrap the bacon around the chicken. Can’t wait to try it! I would love to have these for dinner. Elegant enough for guests, too. Thanks for sharing! We enjoy BBQ all summer long, but sadly it’s been too long since I’ve done kabobs. Thanks for the reminder, and I’ll be sure to add bacon next time!!! They look delicious!! You had me at bacon! 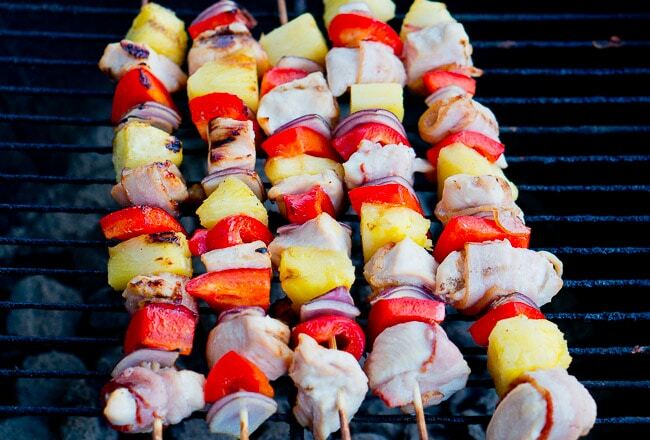 These kabobs look delicious! I love cooking on the grill, haven’t made a kabob in ages. Adding this to my weekend menu! More kabobs! Love it – especially the pineapple plus bacon combo with the chicken. Sounds so delicious! Cheers to more grilling nights! Beautiful job with this classic flavor combo! I can’t believe I haven’t made any kebabs yet this summer. The flavors here sound fantastic! These kebabs are screaming summer! Love the bacon and pineapple combo to go with. Looks so delicious!